Kæstur hákarl: treated shark, to be precise. Safe to say, I wanted to know more about this fascinating ‘weird food’ and try some. What actually was it? Was it really that bad? Would I retch or would it actually be, like a lot of oddities, perfectly fine? At the base of a big slug of green cliff, where wispy waterfalls flittered downwards and some lazy horses snuffled about, was a lonely farmstead: Bjarnarhöfn. Some friendly and exuberantly fluffy dogs curled around my legs as I got out of the car; the only one in the driveway. Outside were tables be-laden with different sizes of pebbles and volcanic rocks. The farmstead resembled three white corrugated iron portacabins with red roofs. Unglamorous and workaday. Inside were a couple of old local men with cracked smiles were jilting away in ancient-sounding Icelandic. One of the men was the owner. A younger lady came out of the larger hangar-like cabin and approached me with a smile. She was Italian and was working here for experience. ‘No, just me.’ I pointed to my car. I begrudgingly consented and went outside to be licked to death by the sheepdog. Between the farmstead and the freezing waters of the Greenland Sea was a grassy meadow dotted with cold-looking white crosses and a squat little black church made of wood. All the ecclesiastical buildings in Iceland seemed only big enough for a handful of people and had a touch of sadness about them. As if between Norse Gods, elves and modern secularity they held no particular sway. My revery was interrupted by the crunch of tire on gravel and the hiss of a coach door. Americans. 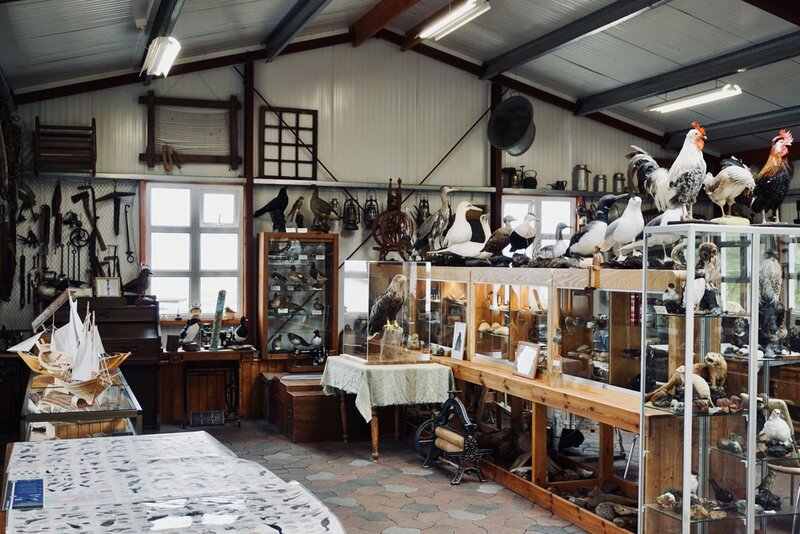 The inside of the museum room was a surreal cornucopia of hunting equipment, boats, wood beams, bones and shark jaws, traditional clothing, paintings of boats and mountains, and even a stuffed seal. It was completely full, so much that the eye never really rested on anything but got more of a general idea. We watched a video that divulged facts with English dubbing. Traditionally the huge, lumbering Greenland sharks that drift the deep waters of the north are caught, beheaded and gutted and buried in a shallow hole and covered with sand and gravel. Stones are placed on top to press the body, thus squeezing out the fluids. Depending on the season the fish ferments for 6-12 weeks. After fermentation, the shark is taken out, cut into strips, and hung out to dry. This odd process is a necessary evil, as the ancient sharks are full of poisonous urea and trimethylamine oxide so the fermentation and ageing made it safe for old-world Icelanders to eat. Then came the foodie moment of truth. Time to try one of the most legendary weird foods. A young man, I think he was the owners son, Guðjón, came out with a tray of shots and a little plastic pot full of little pasty, chalky-yellow chunks of shark. I had seen the shark outside prior to this moment. It was hanging in a shed, open-air but for the roof, shiny and dirty brown in colour and with the dark rumpled skin still on it. It reminded me of the jamón that hang in Spanish bars. It didn’t put me off but the smell of meat and urea could be detected metres away as the wind changed. I first watched the silver-haired Americans have a go. There were scrunched up faces, hands over mouths, shrugging shoulders, faux retching; the lot. I dived in with the largest chunk I could find. It tasted and smelled like some parmesan had been doused in ammonia or rubbing alcohol. There was a burn in the back of the mouth like when one has taken a shot of vodka. The texture was like a firm piece of pancetta fat. It was objectively not nice, but wasn’t horrendous. It was easily edible, but I couldn’t imagine eating large mouthfuls. Fortunately the tradition was to chase the flavour down with Brennivín - literally meaning ‘burned wine’: an Icelandic schnapps flavoured with caraway. It was an aquavit that I developed quite a taste for. The bottles used to sport a white skull on a black label and so adopted the moniker svarti dauði - Black Death, to which the tourist books still refer. Unfortunately I couldn't indulge at the museum as I was driving. I bid farewell to the museum, its dogs, hodgepodge of workers, and the swinging slabs of shark, and re-entered the lava fields.